Download the study BMW C1 here. The cities currently meet most of human activity is this concentration of activities therefore jobs which explains the constant rural exodus of recent years 200. The countryside is emptying giving birth to cities increasingly huge. Many Geo olicy Institutes announce rightly Megacities the huge development for the next century, bringing together each of them over 20 million inhabitants. This tendency is more characteristic of industrialized countries but in developing countries familiar voice from a few decades the same phenomenon. problems we limited to the transport sector. Urban activities require large transportation population, the centers of cities are saturated as well as transport by the population. The dwellings in the center cities are expensive and there is insufficient space to live near their workplace. The people therefore migrate outside the center to create suburbs and crowns to tens of km from the center. More rarely found a job near home and it is often through much of the city to get to work. The construction of huge areas of dense housing near the limit activities that require movement but I doubt that in France the dormitory towns based on the Asian model are emerging (and that's good). The urban population has to move regularly and systematically more or less important. The problems caused by these displacements are many but can be summarized in the word saturation: saturation of voice traffic and air. Let's see how policies and builders try to reduce the congestion and we will focus particularly on the design study of the new urban scooter 100% BMW C1 (CityOne). 2 comment on "The BMW C1"
you have that in Germany, which is not the most in ecology late, motorcycles are not affected by the restrictions of movement in the zones in strict confidentiality, and since 2007 ...? Derogations from the obligations of the environmental identification sticker. The following vehicles are also exempt from the driving ban by § 40. 1 federal law that "Pollution Control Act"
5. ambulances, medical cars with the appropriate identification "medical emergency" (§ 52 para.6 Regulations on licensing of road traffic). according to § 3 para. 1 no. 1 to 3 regulation "aG", "H" or "demonstrate BI"
7. vehicles for special rights under § 35 Rules of road traffic can be caught in the same frame. 10. Oldtimer (§ 2 no. 22 of the registration regulation of vehicles), an indicator according to § 9 by. § 1 or 17 directing the registration regulation of vehicles, and vehicles in another Member State of the European Union, another party to the Agreement on the European Economic Area or Turkey are allowed, provided that they comply with equivalent requirements. Each municipality or city may authorize exceptions to a ban without an environmental sticker. 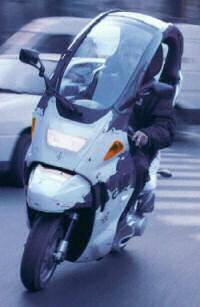 The special type of vehicles such as quads and trikes are not covered by the law on emissions in general. It is essential here because this vehicle is registered. This was achieved mainly here for it to be considered a motorcycle and therefore not as a vehicle that could be obliged to bear the stickers of identificationj. Quads and trikes have a car license, but not within the regulation of the thumbnail. Rule of thumb: vehicles 2 and 3 wheels do not get the sticker and can still enter the German environmental zones. Quads are part of the vehicle category L assigned and do not require any environmental badge.